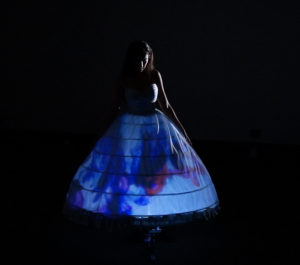 Enchanted Wearables explores the limit of the self in its relationship to others through the medium of clothing. The augmented gown uses a rear dome projection system on the surface of the fabric. The system comprises laser projectors and mirror structures talking wirelessly with a computer, within which is contained both content and warp projection mapping software. This novel technological interface presents both a performative element and a seamless integration in a woman’s life experience. This wearable project questions the boundary between the self and others, the boundary between the individual and society, and the boundary between the body and nature.